When Luke was only two, I watched him derive absolute pleasure in first selecting, then meticulously removing stickers from a 100-page sticker book to place on his “decorated” tummy. 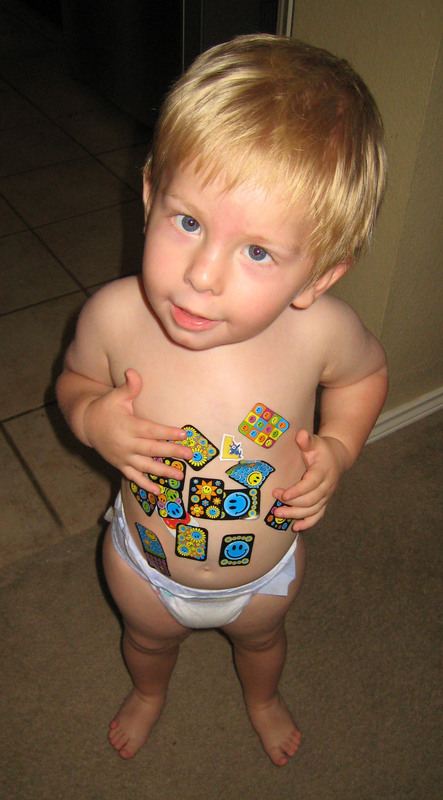 Some of the stickers were difficult to peel off and the exercise in dexterity awarded him with a great sense of success and accomplishment. With each new sticker the two of us celebrated with cheering, hand claps and high fives. If time had allowed, his whole body might have been covered. Be assured my sticker stash will never run dry! Sticking with things is a characteristic children need to be taught. It’s easy to want to give up when things stop being fun or circumstances become difficult. But giving up is seldom the right answer. Sticking with things fosters problem-solving, develops tenacity, strengthens perseverance, salvages relationships and gives rise to dependability. Take quitting seriously and don’t allow it to become a pattern. Walk alongside your child during tough times so they don’t feel alone, but teach them, “if at first you don’t succeed, try, try again”. The rewards of going the extra mile and trying a little (or a lot) harder will almost always exceed the pain experienced in the process. Know that your child’s life-long foundation of stability is rooted in learning how and when to stick with things instead of giving up! Prayer: Heavenly Father, protect my children from the temptation to give up when their lives, jobs or relationships become difficult. Give them wisdom as they deal with problems, and develop in them the courage and self-discipline to never give up on people, on life, or on You. In Jesus’ Name, Amen.